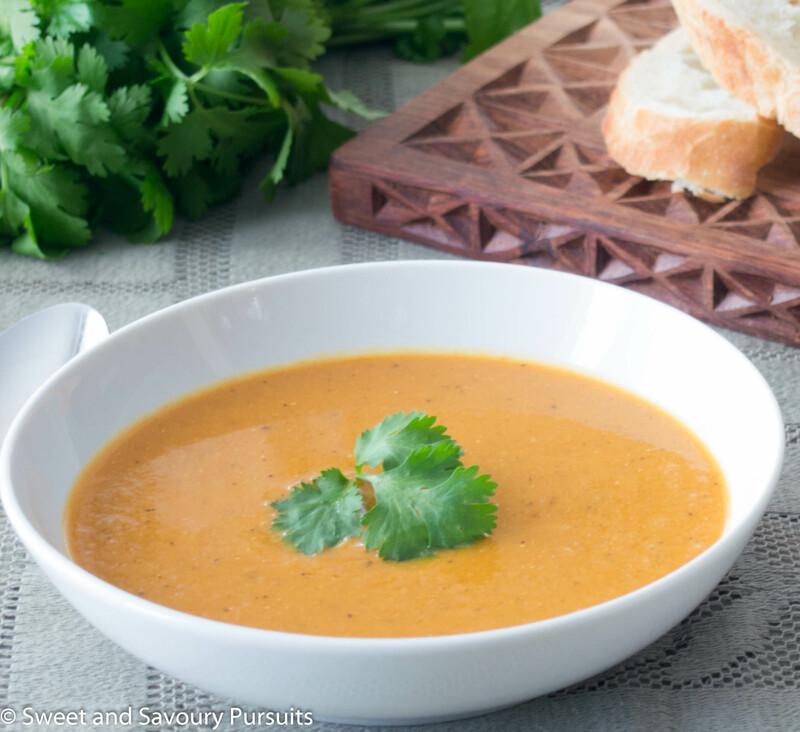 This easy and delicious pureed Red Lentil and Cauliflower Soup is flavourful, nutritious and perfect for warming you up on a cold day. I’ve been wanting to make this Red Lentil and Cauliflower Soup for a couple of days now. I decided today was the perfect day for it and I’m glad I did. It was just what I needed to warm me up and satisfy my craving for something curry-ish. I love the combination of spices such as curry, cumin and coriander and what better way to savour them then in a warming soup on a cold day. The aroma that filled my kitchen when I made this soup was so enticing that I couldn’t wait to sit down for dinner. Though I used chicken broth in this recipe, you could easily use vegetable broth to make this a vegan soup. I used a hot curry powder because I like spicy food, but if you prefer something with less heat use a milder curry. Also, if you really enjoy the flavour of cilantro you can add some to the pot of soup just before you purée it in the blender, delicious! This easy and delicious Red Lentil and Cauliflower Soup is flavourful, nutritious and perfect for warming you up on a cold day. Heat the oil and melt the butter together in a large saucepan over medium heat. Add the onions and cook stirring a few times until they begin to get translucent, add the minced garlic, jalapeno and grated ginger, and cook stirring until softened, about a couple of minutes. Add the cumin, coriander, curry, turmeric and salt and cook stirring until the spices are fragrant, about 1 minute. Add the canned diced tomatoes and their juices, the chicken (or vegetable) broth, the lentils and the chopped cauliflower florets. Bring to a boil and then lower the heat to a simmer and simmer the soup for about 25 minutes, stirring often so that the lentils don’t stick to the bottom of the saucepan. When the cauliflower and lentils are well cooked, add the 2 tablespoons of freshly squeezed lemon juice and the freshly ground pepper. Transfer the soup in batches to a blender and purée until smooth. Pour the soup back into the saucepan and if desired you can adjust the consistency of the soup with more broth or water. Garnish the soup with the chopped cilantro. There is nothing like the taste of homemade soup! It seems so delicious!